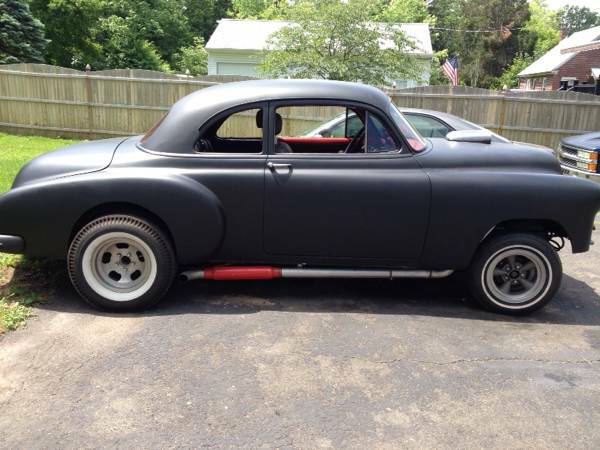 1950 Chevy business coupe gasser. 406 Chevy small block with mild cam/ edelbrock single carb tunnel ram, edelbrock 4 barrel carb. Turbo 350 auto trans, Chevy 10 bolt rear. Drop straight front axle. Over size drum breaks all around. Manual steering, manual breaks. Very cool Mickey Thompson cheater slicks. Speedo, temp, oil pressure, amp, tach all work. Dual fan set up so no overheating issues. Cherry bomb exhaust with electric cut-offs for open headers. It will absolutely roar! Leather 6 way power bucket seats, not hooked up to 12 volt yet. Very cool and fun to drive car! Looking for 12,000 obo or trade for hot rod/ rat rod/ lead sled. Call me, looking for cash to buy another toy. Make me a fair offer and it's yours!! Please ask any questions. Thanks.